You should consult the literature for the marketplaces you plan to partner with, but if you make it bigger than 1400 wide, you should be set for most (I won’t claim all) stores, including these biggies: Amazon, Google Play, iTunes, Barnes & Noble, and Smashwords. Also I highly recommend picking a value somewhat above 1400 pixels but probably less than 2000. In resolution, bigger is better, but you aren’t going to be putting this on a billboard or a movie screen…Or are you? Note: It is my opinion that if you go out of your way to generate five different versions of the cover for various purposes, you are making work for yourself. If you are converting through Calibre, it doesn’t matter what resolution cover you feed it, you can unzip an epub from Calibre, look inside, and see that the cover dimensions have been reduced to something like 546×729–the specific scale depends upon what device you chose to optimize for. When you open that same file up on a device with a different screen size, that device will resize that image automatically. (This implies that the best practice would be to always optimize for a device with a large screen, so it will scale down on most devices. Choosing “Tablet” or “Default Output Profile” will use large images, for example.) So my takeaway point is: make it easy on yourself, create no more versions of your cover than you absolutely need. I believe that number is just one. This doesn’t include working copies and source files, obviously. There are other best practices you should observe as well, but with the possible exception of iTunes–the pickiest of partner programs–non-compliance might not necessarily be a deal-breaker. The title should match the internal title (as on the title page), and both should match the title you enter as metadata, non-standard styling such as untraditional capitalization aside. Unlike album art, which need not display the title of the work, your ebook cover should. A double-standard, I know…but resist the urge to get avant-garde. The cover should be a unique identifier. It must not be identical to the cover of any other book, even one of your own, except of course other editions of the same content. Say you are in a spot where you have a preexisting image that you want to use but it is inconveniently low res, or that you, not being a graphic designer, failed to create a high-res image to begin with. There are free tools floating on the Internet for image resizing. Check out Smilla, for example. I believe this is the software I tried out at one point, but then I abandoned it because a side-by-side comparison with the same image enlarged in Photoshop showed that Photoshop did at least as good of a job. But if you don’t have Photoshop, check out Smilla. For Photoshop: Simply do a good ol’ Image>Resize>Image Size. Enter your desired dimensions and select “Bicubic Smoother.” Good Guy Photoshop even tells you (at least in Elements 8) that this is “Best for Enlargement”. Do the locomotion with me. Once is enough. Resize the same file as few times as possible. Really, once is too much already. Be sure you keep an original version of the file so that if you miss the mark on your first resizing, you can go back to the original and resize that. The more you fiddle with size, the more distortion you will introduce. Make sure you zoom in to 100% on your resized image and see that it looks good at full size. If not, try enlarging it with different settings, or try saving it with different settings or as a different format: png instead of jpg, for example. Personally, I like PNGs. They look better to me. At least they don’t exhibit that little bit of noise or distortion that JPG compression sometimes introduces. However, Amazon Marketplace requires that you upload a 1400+-pixel-wide JPEG of the cover. So at the very least, you should have a JPEG, and if that JPEG looks good, you might as well use it for everything. While low-quality jpgs are sometimes noticeably distorted, a high-quality one should not be. Just open it up and check it at 100% zoom before you upload. at least 1400 pixels wide? displaying the title as it appears in the metadata and inside the book? Really that’s all you need, and it’s not much to ask if you think about it. So don’t be overwhelmed. what a great and helpful article. We’ve also made a list for all authors out there to find the right ebook cover size. Thanks for this. It hasn’t fully answered my questions but it does give me support to keep on re-submitting my ebook to Smashwords. I wrote my ebook in Pages then exported it to ePub. I then used Caibre to tidy up the div span errors etc. Now the Smashwords cover spec is 1600 pixels x 2400 pixels. So I resized my cover in iPhoto to this spec. but on export from both Calibre and iPhoto it drops to 452 x 678. This problem has really got me bushed. any thoughts. Craig, I tend to avoid iPhoto and can’t speak for it. You can try resizing in Preview and doing a save-as. You might be able to control how Calibre resizes the cover by going to Page Setup at conversion and selecting “Tablet” for your output profile. This will disable image resizing. 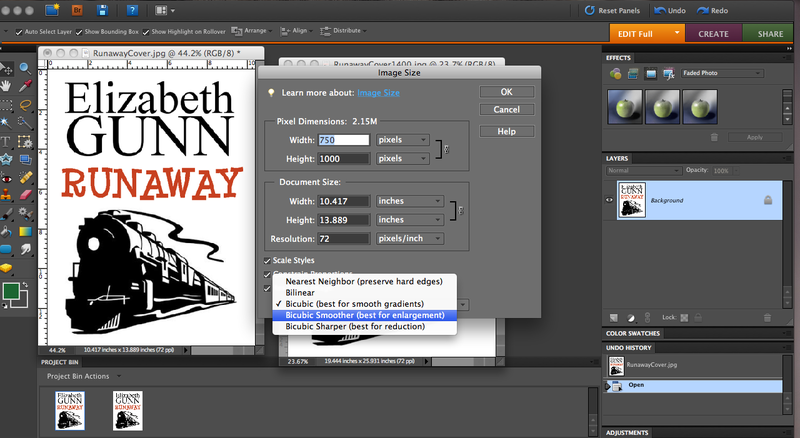 If that doesn’t work for you, you can use Calibre to “explode” your already converted book by right clicking the title and selecting “tweak.” Then you can manually replace the output cover with your original image. Also, I haven’t worked with Smashwords, but I think that marketplace cover size recommendations have more to do with the store image than the embedded cover in the book, but of course the higher res the better for that too. can you please tell when you self-publish an ebook, do you only need to make a cover do you not need to put the back cover of it meaning the blurb and stuff? Joe, ebooks don’t generally include a back cover, and it is best practice not to include one. The blurb and other information (price, isbn, etc) that normally goes on the back of a print book is available to the customer on the store page where the ebook is purchased, whether that’s Amazon or iBookstore or what have you, and not everybody ventures all the way to the last page of an ebook, so the idea of a back cover doesn’t add anything to an ebook. Help,help,help, please. My ebook manuscript and images are summitted with all the other requirmwnts like ‘about the book’ and ‘ about the author’. I paid a vanity publisher, I am told. Now I have been told that my front and back cover ( just learnd from you I do not need a back cover ) are not acceptable due to the drawings of drud paraphernalia. Can you help me know what is the regulation so I can adjust? Maybe the back cover could be used as the front cover. The book is about insights for parents off adult children who are addict to drugs and or alcohol. It is an illustrated book with great artwork. Cindy, I think the best thing to do would be to check with the vanity publisher to see what the standards are for that particular publisher. If you find that publisher won’t publish images of drug paraphernalia, you may have to find one who will. Alternatively, you might be able to appeal to that publisher’s customer support rep on the basis that your book is an inspirational book about recovery, and not a glorification of drug use. The Amazon Kindle Marketplace reserves the right to prohibit “offensive content” where what is offensive is up to their discretion (see here). It’s hard to say whether this would affect your publication. I’m having a harder time finding a direct answer from Apple iBooks. I know they have parental controls to filter books marked as having sexual content, but I don’t see any guidelines referring drug use or potentially offensive content in general. Lovely illustrations. The color work is superb. Good luck with your book! 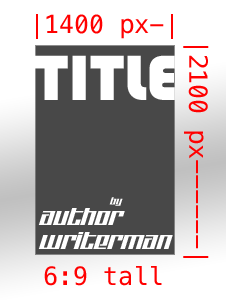 I have found this website and the resizing tool very useful to meet my ebook cover resizing requirement. Thank you very much for sharing. I have received permission to use a photograph from a fine art photographer for my ebook cover. But it is a horizontal landscape and I will only be needing the middle section for a vertical cover image. What size file should I be requesting from the photographer. He will be giving me the full horizontal pic and not cropping it for me. I want to make sure that when I cut two thirds away that I’ll have enough pixels across to get to 1600 wide. Would a 5 MB file that’s 300 dpi and a jpeg be large enough after I crop it to give me the pixel width and height I’ll need? Or do I only need something small like 3mb or smaller? I don’t think I can estimate image dimensions from filesize in MB. 5 MB sounds very large for a jpeg, but it’s the pixels per edge that are more important than either filesize or dpi. If you know that you need to crop the width to 1/3 and you want the cover to be 1,600 px wide, you can ask him for an uncompressed jpeg that’s at least 4,800 px wide. If he’s a professional doing print work, I would guess it’s likely his master for the image is at least that big. Try to err on the side of getting an image that’s too big if anything. You can always size something down, but enlarging hurts the image quality. If he doesn’t have an version that large, ask for the largest he’s got and you’ll know that’s what you have to work with. And there’s more leeway in an ebook cover, than in a print cover, if your original image is not as hi-res as you’d like. I think the quality of the image is more important if there’s the slightest chance of doing a print book as well, and you should design with print in mind first if that is the case. Thank you Bret! That makes sense, I should have thought of it. lol….just times by 3 the finished width I need. I have asked for just that. thank you for your help! No problem Stacey. Best of luck with your publication! Pingback: Complete Guide to Book Cover Sizes - Why Do They Matter?